Beggin' Thick Cut Hickory Smoked Flavor Dog Treats bring out uncontainable excitement in dogs. 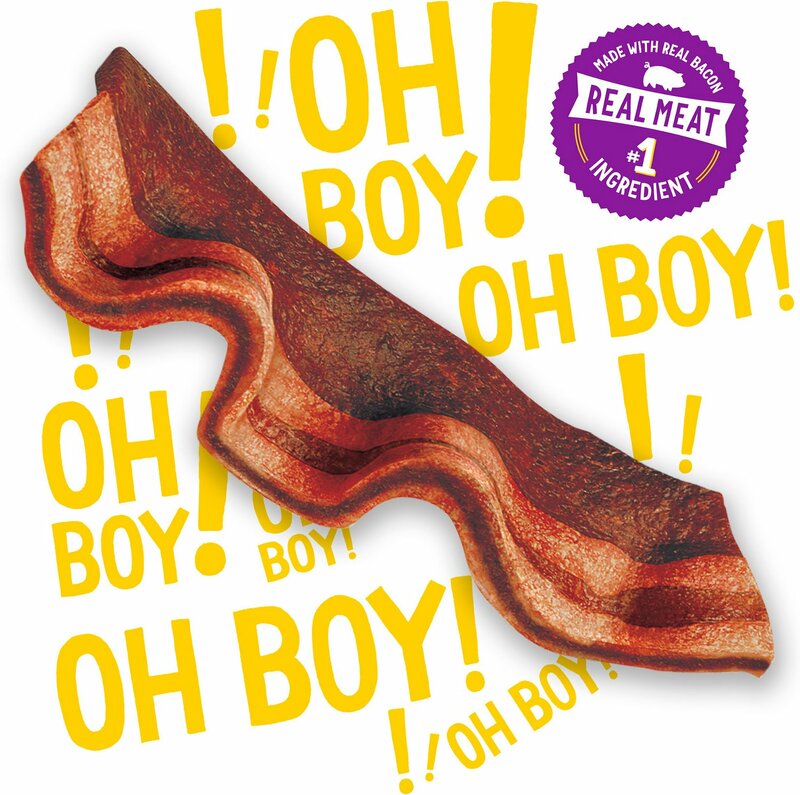 Made with real bacon, these mouthwatering treats have a smoky, hickory scent and a savory, meaty taste that dogs go wild for. Soft, chewy, delicious and easy to break apart, Beggin’ Thick Cut Strips provide a fun treat for dogs of all sizes. Made with mouthwatering, real bacon. Smoky bacon flavor that your dog will love you for. Soft, chewy texture makes it easy to chew and is great for training. Thick-cut, bacon sliced treat so your dog will feel extra special. Lower calorie treat, so you can be guilt-free when indulging your pup. 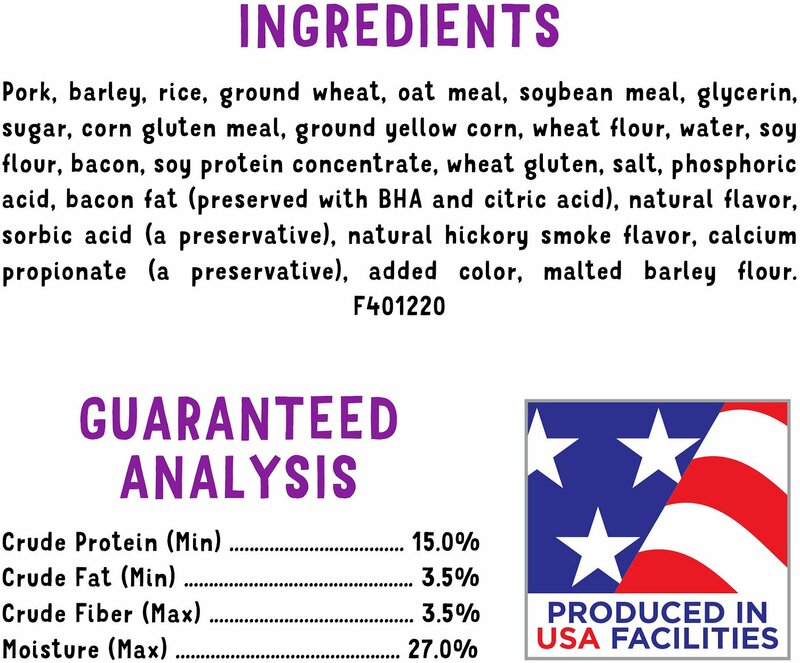 Pork, Barley, Oat Meal, Brewers Rice, Soybean Meal, Ground Wheat, Sugar, Corn Gluten Meal, Glycerin, Wheat Flour, Wheat Gluten, Water, Ground Yellow Corn, Bacon, Soy Protein Concentrate, Salt, Phosphoric Acid, Natural Flavor, Sorbic Acid (a Preservative), Bacon Fat (Preserved with BHA and Citric Acid), Natural Hickory Smoke Flavor, Calcium Propionate (a Preservative), Red 40, Yellow 5, Blue 1, Yellow 6. D-4012. Feed as a treat to your adult dog. This product is a treat and is not intended to be fed as a meal. Feed 1 treat for each 15 pounds of body weight daily, not to exceed 5 treats per day. The caloric intake from treats should not exceed 10% of a dog's total daily caloric requirement. If treats are given, the amount of food should be reduced accordingly. Monitor your dog to ensure treat is adequately chewed prior to swallowing. Break into small pieces for adult small/toy breed dogs. 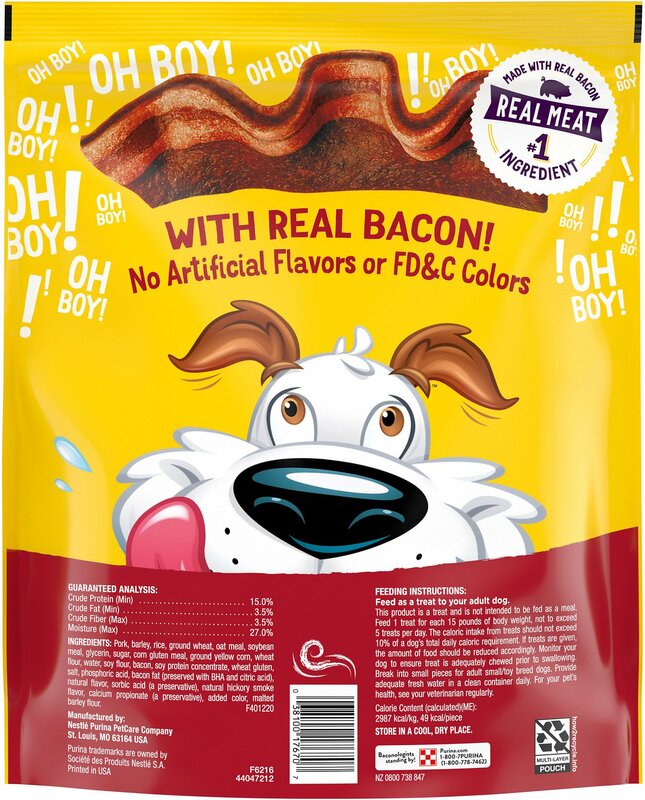 There's nothing that will turn your pup into a happy pooch like the taste and aroma of real, mouthwatering bacon. Whether you choose Beggin' Strips, Party Poppers, Littles or Skinny Strips varieties, you can guarantee your pup will be begging for that savory, meaty flavor and chewy, tender texture time and time again. When it comes to Beggin', it'll be love at first sniff. 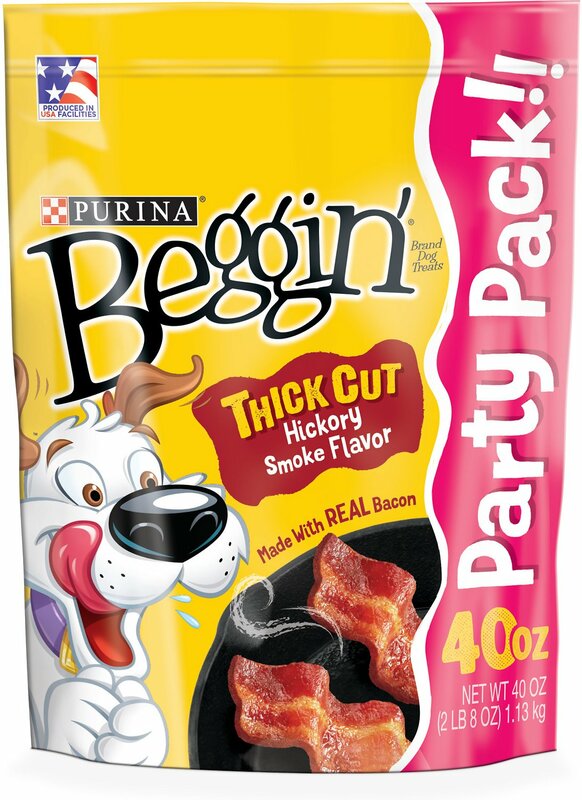 Dogs go crazy over the smoky, sizzling scent and savory taste of Beggin' Bacon Strips. Soft and easy to break apart, Beggin' Strips provide a fun treat for every kind of dog. Have your pup doing backflips for these extra special, meaty treats that are great for both training and anytime treating. Meaty meets mini with these bacon-flavored treats that are created especially for smaller dogs. 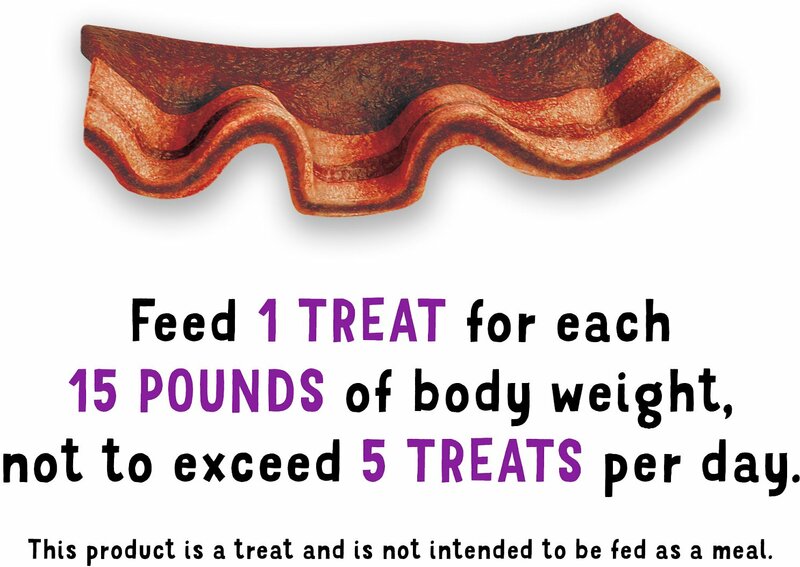 Let your tiny pooch get in on the bacon sensation with treats made with his little mouth, teeth and body in mind. With only 7 calories per treat, you can feel good about indulging your little guy. Beggin' Skinny Strips Turkey Dog Treats are delicious, low-calorie treats that won't compromise on taste or flavor. Whether you feed this to your dog as a reward or treat him to a strip as a special surprise, feel good knowing that real turkey is used as the very first ingredient. Dogs will come running when you break open these tempting turkey strips—they'll look so delicious you might want to take a bite yourself! Keep the party poppin' with Beggin' Party Poppers Treats. Each bite-size treat has classic Beggin' Strips wrapped around a delicious, cheese-flavored center for an enticing combination your dog won't be able to resist. Made with real bacon, Beggin' Party Poppers will bring out uncontainable excitement that you won't see with any average treat. Beggin' Dog Treats feature tantalizing bacon in every bite that will have any bacon-loving pup begging for more. 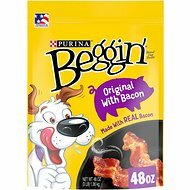 Since selling its first product in 1993, Beggin' has created a diverse line of bacon-flavored treats that are perfect for training and rewarding your deserving dog. LOVE this option and the price but both times I've ordered the bags have had holes or busted seams and then I have to transfer the treats to an airtight bag. For some reason my dog does not like the thick strips. He leaves them lying around the house. However he loves the regular Beggin strips and will do anything for one. Beggin Strips are the reason our dog springs up from where ever he is when he hears the bag. Their favorite treat. All 3 dogs won’t eat any other dog treat. Great value and size. Highly recommend for all dog sizes. 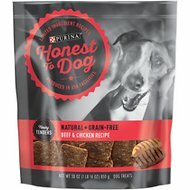 Our dogs love these treats, this is their favorite flavor. They eat so healthy, it is like doggy candy to them! These treats are my dogs favorite and it’s so cute to see them when I open the cabinet where they are stored. They look and smell like the genuine item. Chewy is the best source for all my pets treats. 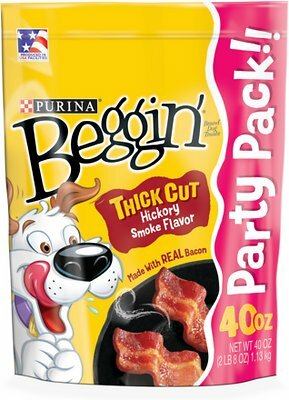 always excellent communication (if needed), and the dogs love this type of Beggin strips, and the prices are great! 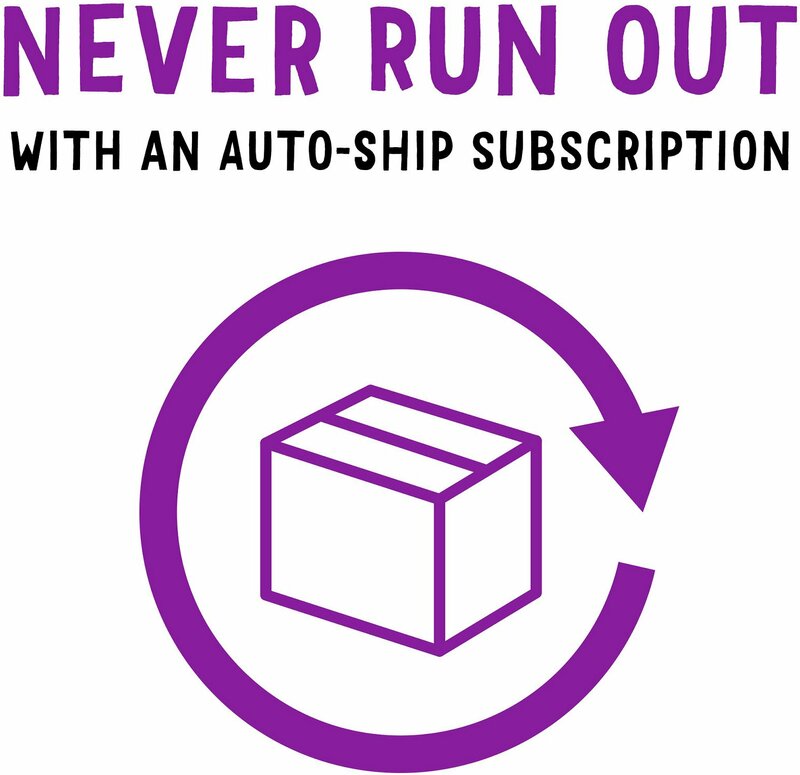 This is a great product with fast delivery from a wonderful company.